Expect to hear (much) more about this in days to come, but I am officially an Ironman! Now, I’m going to eat and sleep and spend three days telling myself I’ll never exercise again. There is a certain fearlessness in children. They haven’t yet mastered the art of self-preservation. I distinctly remember the only two times I ever went skiing. The first time, I was in elementary school. I was bombing down hills without a care in the world (obviously easy ones, but still!). Towards the end of the day, I even purposefully aimed for a lump on the hill, caught some air, and landed successfully. No big deal, no fear. No thought of what would have happened if, instead of landing successfully, I had wiped out. A few years later, I went skiing again and gingerly inched down the slopes, desperately slowing myself when I got too fast. I remember wondering why I was scared this time when I distinctly remembered not being intimidated at all a few years earlier. That was when I realized I had lost my childhood fearlessness… or maybe just my childhood confidence. It still comes back at times, usually when I have no idea what I’m getting into. For instance, in college, I started thinking about switching from competing in the heptathlon to running the steeplechase because I just could not master the form required for the field events. (I just ended up quitting track entirely instead…) My coach wanted to see what my initial form over the water steeple looked like, so he told me to give it a shot. “Now, this is new, so don’t get frustrated by how it goes the first time,” he said. “Okay,” I said, while thinking, This is easy. It’s just hurdle… I’ve done it a million times. So I ran up to the steeple, pushed off the top of it, and landed easily with one foot in the water and my next step taking me back up to the dry track. “Yeah, that was pretty much it exactly,” said my coach, visibly shocked. I had a similar experience with my half Ironman. I decided I wanted to do a triathlon, so I signed up for a local sprint triathlon with a pool swim that actually took place the day before the other two legs. I rode my hybrid commuter bike in my running clothes and running shoes (it’s still my fastest T2 time to date!). I liked training for it, so I decided I wanted to be a triathlete and signed up for the Boise 70.3 coming up the next year. I got a road bike in January and raced in June. The race was my first open water start and only my second open water swim with other people. I was essentially brand new to endurance athletics. But I trained and put the time in and didn’t know enough to really realize I was doing something that most members of triathlon forums across the web would consider less-than-ideal. And you know what? I finished the race with a time of 6:05:44, eating trail mix and Pop Tarts on the bike and running my first couple miles off the bike way too fast. Not bad at all for a first half Ironman, especially considering how new it all was to me. The whole training cycle, I was certain I would finish the race if I put the work in. I didn’t even realize that what I was doing was a pretty big deal. I didn’t have that same advantage going into the training cycle for a full Ironman. I was well aware that an Ironman is a Scary Thing. I’d seen in on TV and read about it online. It is Intimidating and Epic. It is a bucket-list item, and for us mere mortals, a Challenge more than a Race. People crawl across the finish line because they are too depleted to even stand. Now, caution is great. I’m a big fan of caution. And the fearlessness of kids doesn’t lend itself well to distance running. Anyone who has ever lined up at the front of a 5k start with a bunch of ten year olds that, upon hearing the starting gun, sprint as fast as they can for as long as they can (generally, about a quarter of a mile) knows that complete fearlessness can backfire. 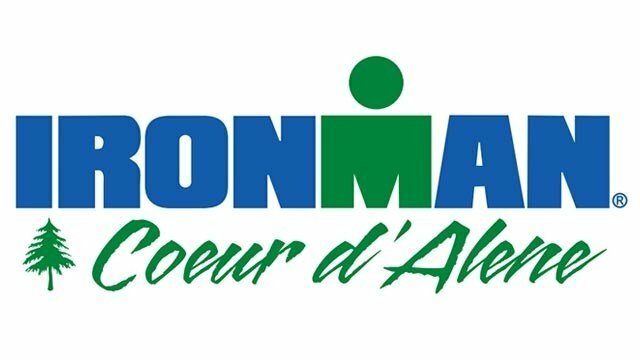 I still have a very conservative race plan because, in the Ironman, running a conservative race is far and away the best strategy for a first timer. But I have caution in droves, and a lack of it has never been my problem. It’s the presence of fear and a lack of confidence that has tended to hold me back. So as I finish this taper and toe the line at Ironman Coeur d’Alene in a few weeks, I’m going to try to channel some of that child-like fearlessness. I’m going to try to compete with the confidence of someone who is ready and has no doubts that the task at hand is achievable. I’m going to try to create that same mindset that propelled me over that steeple with ease—the same mindset that allowed me to see a bump on the hill in front me and decide that if I hit it, I could fly. I didn’t mean to plan an Iron Rehearsal this past weekend. I just planned my long workouts in a way that worked best with my schedule. I took Friday off work so I could fit in my long bike ride. I planned a long run Saturday morning so I could practice running long and easy on tired legs. And I planned a long swim after my run because it was hard to fit it in anywhere else and I actually enjoy long, easy swims after long runs. It wasn’t until I was done with my heavy two days of training that I thought a little harder about the distances I had covered. My Iron Rehearsal started around 6:30am on Friday when I took off on a long bike ride around the Greater Salt Lake area. The majority of the ride is perhaps best left to the imagination as I’m sure it will be much more interesting to any readers that way. The basics of it were that I felt relatively strong and managed to hit a 17.1 mph pace over the course of almost 120 miles (and still run a few miles off the bike! ), a feat which shocked me more than anyone else. After my ride, I took the rest of the evening to recover. I did a lot of sitting around and eating. But mostly, I spent the time actively dreading my run the next day. I had no idea what to expect from a three hour run less than 24 hours after my longest bike ride ever. I knew my run after my Olympic triathlon had been pretty miserable. I knew that three hour runs are never fun. So the only reasonable assumption was that my run the next day would be doubly miserable. Saturday morning dawned at I was up at 4:30am to prepare for my run. I ended up leaving around 6:30am. I started off slowly, waiting for the misery to come. And it didn’t. Don’t get me wrong—it was a hard workout. My legs were aching so badly by the end that I thought it might be better for everyone if they just weren’t there. But the endurance was there. My muscular strength and aerobic strength never faltered. I never felt like I couldn’t keep going. I never wanted to stop to walk (stop to sit down, maybe, but not walk!). I was physically strong enough to finish the run fairly easily, and my mental strength was up to par that day as well. I rested for a couple of hours when I got back from the run, but it wasn’t long before I decided to head to the pool. I could have waited a little longer, but I wanted to fully enjoy as much of my Saturday as possible. Once I got to the pool, I swam a 4000 yard workout. I actually enjoyed getting into the water and cooling off (it had turned into a pretty warm day). Most of my swim was steady-state at a comfortable pace, but I did a few fast 100s at the end and actually felt good doing them. Typically, when I’ve done a long swim the same day as a long run, I struggle a bit towards the end with general fatigue and a lack of energy (perhaps due to running low on fuel). On Saturday, though, I felt strong throughout the entire swim. As I was rinsing off in the shower afterwards, I looked down at my watch. It was 1:57pm. I thought about my past three workouts. I had started my long ride around 6:00am the day before which meant that, over the course of the past 32 hours, I had ridden 119.84 miles (over the distance needed for the Ironman), run 19.45 miles (almost ¾ of a marathon), and swum 4000 yards (just barely shy of 2.4 miles). I think it’s impossible to feel fully prepared for your first Ironman, but in that moment, I felt pretty close. 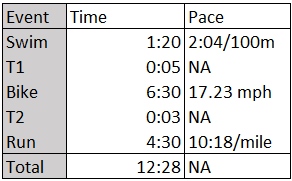 Months and months ago, I threw out some potential goal times for each leg of the Ironman that I wanted to keep in mind as I trained. Those goal times have been percolating in the back of my head since then, so I thought it would be useful to re-visit them and evaluate how I feel about hitting those goals now that Ironman Coeur d’Alene is just under two months away. Surprisingly, my goals that I set rather arbitrarily almost a year ago held up rather well—so well, in fact, that I’m going to keep them around as they are. My number one goal was and is simply to finish the race, and I will throw time goals out the window if I need to in order to make that happen (for instance, if it’s 100°, you better bet I’m going to re-evaluate my race plan!). However, I have some time goals that I would like to aim for, if circumstances allow. For reference, here are the time goals I set for myself. I started attending Masters swim team practices not long after I set my original goals. Masters has helped me improve my swimming much more than I expected, and I am now averaging much faster times than even my A-goal in the pool. (For reference, my 1000 yard time trial predicts a pace of 1:52/100m over a 5k of swimming.) However, due to the uncertainty of open water swimming, I’m going to keep my goal the same, with the hope that I can pick up a few extra minutes on the swim. Swimming in open water is a lot less certain than swimming in the pool. Wind can make the waves harder to navigate. Poor sighting can lead to extra swimming. Swim courses tend to be a lot less accurate than bike or run courses. So with all those uncertainties, I feel comfortable keeping my goals as they are. With any luck, I’ll meet my A-goal with a few minutes to spare. I felt this goal might be a little too optimistic when I made it, and that feeling has only increased over the past year. On hilly long rides, I’ve been lucky to hit 16mph as my average speed. Usually, I sit somewhere north of 15mph, though I’ve had a few medium-long rides (2 hours or so) on flat terrain that have cracked the 17mph barrier. I don’t know what to make of this when it comes to my Ironman bike leg. My awesome carbon wheels have helped, but I still suspect that 6.5 hours (17.23mph) is well beyond my reach. I even find myself worrying about hitting 7 hours (16mph). This is strange to me because in my half Ironman, I hit a 16.8mph pace, and I had only been riding a road bike for a few months. I’m a much stronger cyclist now, so I’m not sure why my paces haven’t been better this training cycle. I know the terrain plays into it, and I know the routes I’ve been riding are a hillier (and contain steeper grades) than the Ironman Coeur d’Alene course will. My stretch goal of 6.5 hours seems a bit pie in the sky, but I’m keeping this goal the same too because I still hope to hit my B-goal and think I have a good chance of doing that, and maybe exceeding it by 10-15 minutes. However, I also need to remember that ten minutes faster on the bike is not worth blowing up on the marathon and losing thirty minutes to an hour. Who even knows how to set a goal for an Ironman marathon?! I feel like my goal times are conservative based on what I’ve been running lately. Most of my long runs have been around an 8:30/mile pace and have felt quite easy. My transition runs (which I have been trying to run slowly) have been between 9:00-9:30/mile. Now, these runs are a lot different than a marathon after 112 miles on the bike. 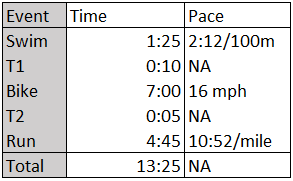 However, I think that this is a reasonably good pace for the parts of the Ironman marathon that I run. I want to run most of the marathon, but I also want to allow myself to walk through aid stations. If I’m running 9:15/mile and walking through every other aid station (or every aid station near the end of the race), I think that both my time goals are quite reasonable. What I really want is to stay strong during the run. That means executing my nutrition plan well. That means not shooting out of T2 like a rocket. That means mental toughness during the later miles in the race. But over the past few weeks, I’ve come up with another goal that I’m trying to keep in the forefront of my mind. This goal is as important as it is corny… have a blast out there. I don’t see myself doing another Ironman anywhere in the foreseeable future, so this race (unless I, heaven forbid, don’t finish!) is probably a once-in-a-lifetime experience for me. As such, I want to enjoy it. I’m hoping to reach the run with at least eight hours left until the cutoff. If I manage that, I’m all but guaranteed a finish, and I want to have fun on my “victory lap.” So when it gets painful, I’m going to try to remember what I’m doing and be excited about it. Get kicked in the face on the swim? I’m doing a freaking Ironman! Struggling through a tough climb on the bike? I’m doing a freaking Ironman! Hot and tired at mile 15 in the run? I’m doing a freaking Ironman! I’m hopeful that having more fun out there will translate to a little less pain. It’s almost here. And after revisiting these goals, I think I’m almost ready. Just because this is a cool picture that I didn’t get to use in my race report!